Like most Novomatic games you get the old-skool sound effects as the reels spin but you can disable them if that’s not your bag. Personally I like them. 20 lines and 3 scatters triggers 10 spins plus the ‘Shogun Feature’ – all this means is that the shogun wild expands during the free games, there is no multiplier but the feature can produce some big wins: I have the screen shots to prove it (see the screenshot above and below!). As usual with Novomatic games, the feature is hard to get as most of the returns are geared around it. The upside is that scatters increase during the bonus round therefore retriggers are quite frequent. Not as frequent as in games like book_of_ra_deluxe or lucky_ladys_charm but they do occur quite regularly. This is a medium to high-variance game, as you need a good bonus round to pay a win worth having but if you can stomach the long lean streaks it is a great game for high hitters. 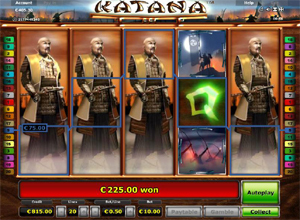 It will appeal to fans of Novomatic’s Mystic Secrets game too, another top slot!